Click here for a list of butterflies seen on on this trip. Puerto Rico is an enticing tropical Caribbean island the size of Connecticut that is part of the United States. This combination of the exotic and the familiar makes Puerto Rico a very special place indeed – good roads, good infrastructure and hotels, coupled with intriguing green plantain soup. 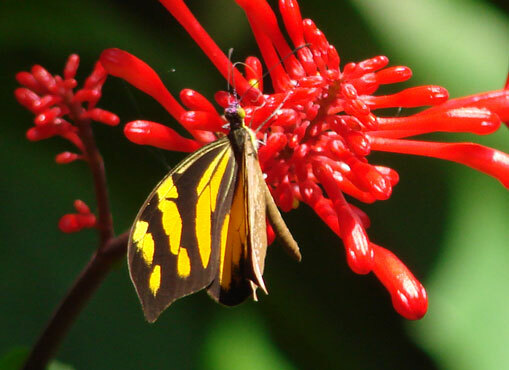 The fourth largest island of the West Indies, Puerto Rico is inhabited by approximately 100 species of butterflies, including 5 species found nowhere else. Another 22 species are Antillean specialties -- endemic to the West Indies. Additionally, although we will not search for them, we may see many of the 16 species of endemic birds. We will be able to circumnavigate most of the island and will visit the Guanica Dry Forest, the largest coastal dry forest in the world and a World Biosphere Preserve along with El Yunque, the only tropical rain forest in the United States. Day 1. Saturday. The tour begins this afternoon at the San Juan International airport. From San Juan, we will drive about an hour west, to the town of Hatillo. Night in Hatillo. Day 2. Sunday. This morning we will visit some beautiful forest areas in the vicinity of Hatillo. Here we will have our first chances for Puerto Rican endemics such as Puerto Rican Calisto (Calisto nubilia), a spiffy red-brown satyr and Antillean endemics such as Modest Sister (Adelpha gelania) and Vee-mark Skipper (Choranthus vitellius). 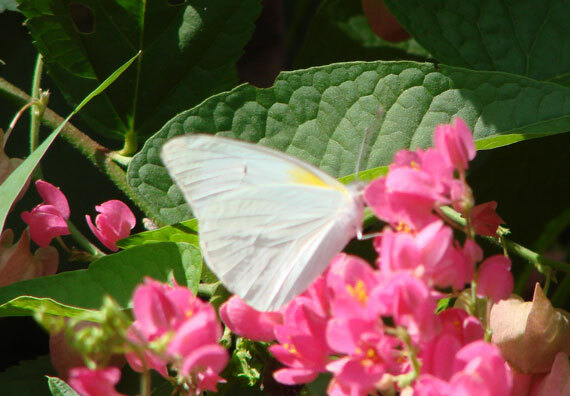 We will keep our eyes peeled for rarely seen Coral-vine Yellows (Eurema leuce) which have on occasion been found here. This afternoon will be spent along the coast where there should be a good assortment of interesting butterflies. 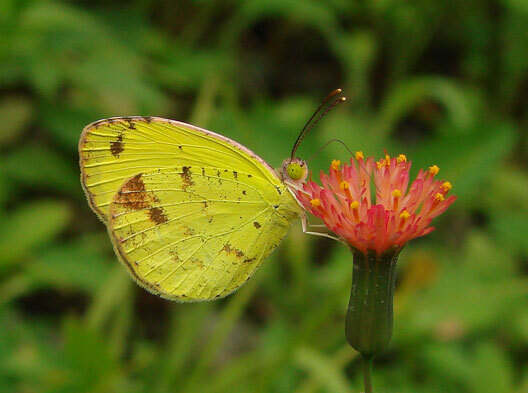 Possibilities include Baton Yellow (Eurema elathea); Cramer’s Scrub-Hairstreak, (Strymon bubastus), a tailless Mallow Scrub-Hairstreak look-alike (with which it flies); the striking Puerto Rican subspecies of White Peacock; and the very distinctive Puerto Rican subspecies of Gulf Fritillary. However, our main target will be the endemic Puerto Rican Harlequin (Atlantea tulita) and the Antillean endemic Vine Hairstreak (Allosmaitia coelebs). The harlequin is a patch-like inhabitant of karst and serpentine areas. Always uncommon to rare, its abundance will depend upon the vagaries of the year and the season. 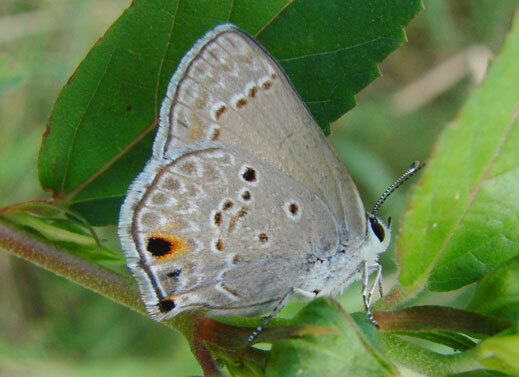 The hairstreak sometimes can be found in the same areas as the harlequin, although both are far from certain. Late in the afternoon we will drive south to the Maricao Forest. Night in Maricao. Day 3. Monday. This morning we will awaken in the middle of the Maricao Forest. The Maricao Forest Preserve is one of the finest in Puerto Rico with a greater diversity of plants than any other Puerto Rican forest. Endemic Puerto Rican Calistos may be abundant and we have also seen endemic Puerto Rican Yellows (Eurema portoricensis) and rare (on Puerto Rico) Two-spotted Preponas (Archaeoprepona demophoon), as well as Antillean Broken-Dashes here. Other possibilities include Schaus’ Swallowtails, Malachites and almost all of the endemic Puerto Rican birds, including Elfin Woods Warblers. Night in Maricao. Day 4. Tuesday. Depending upon how we did yesterday, we will either spend the morning in the Maricao Forest and then drive to the coast, or drive directly to the coast. 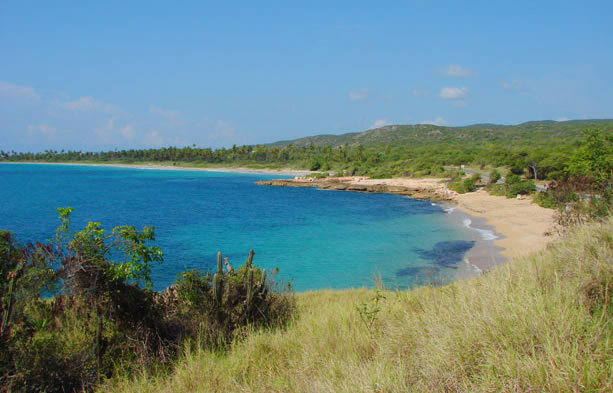 If we go directly to the coast, we’ll probably head to the southwest: to dramatic Cabo Rojo, with its seaside cliffs, and to Boqueron Forest, with its mangrove forest. Both of these areas are very attractive and quite distinct. Night in Guanica. Day 5. Wednesday. Today we’ll spend the entire day exploring the Guanica Dry Forest, a World Biosphere Preserve with tremendous plant diversity. Here we have by far our best chances for Pale Crackers and Puerto Rican Leafwings (Anaea borinquinalis), which may be fairly common. These leafwings, croton-feeders like other leafwings, look very similar to Tropical Leafwings and there is disagreement (what a surprise) as to whether it is best to treat them as a species or subspecies. Other interesting possibilities include Lime Swallowtail (Papilio demoleus), a beautiful Asian species that has invaded the New World – threatening citrus crops, Schaus’ Swallowtail, Florida White, Giant White, Antillean Blue and Florida Purplewing. Puerto Rican Todies, Puerto Rican Flycatchers and Adelaides Warblers are likely. Night in Guanica. Day 6. Thursday. We will probably spend this morning in the Guanica Dry Forest enjoying a different set of pathways through the extensive woodlands. Later in the morning we will drive to Coamo, site of a famous hot springs. Here we’ve been fortunate to see the rare Antillean White (Appias punctifera) along with more widespread but still interesting species such as the Antillean subspecies of Red Rim and of Sickle-winged Skipper. There are some hackberry trees by the hot springs and thus this is one of the few places on Puerto Rico where Antillean Snouts (Libytheana terena) and Dusky Emperors have been found. We’ll have lunch at the very attractive resort here, Coamo Springs. Late in the afternoon we’ll drive to San Juan. Night in San Juan. Day 7. Friday. This morning we will drive east to the only tropical rain forest in the United States, El Yunque. Officially named the Caribbean National Forest, El Yunque is administered by the United States National Forest Service. A paradise for orchids and ferns, El Yunque is also great for butterflies. 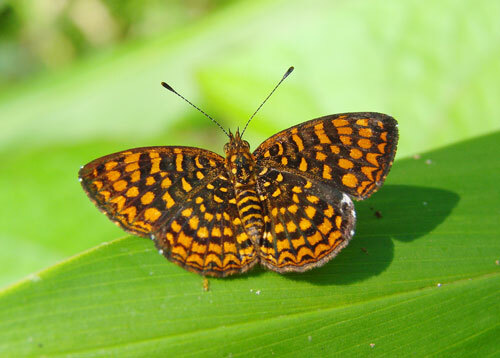 This is a great area for the gem-like Antillean Crescent (Antillea pelops), a tiny but strikingly patterned nymphalid. Also, the El Yunque rain forest provides our best chance for Antillean Mimic-White (Dismorphia spio) a beautiful and slow-flying pierid with a tiger-striped pattern on its upperside. Other species we have seen here include Antillean Mapwing (Hypanartia paullus) Red-and-black Leafwing (Siderone galanthis), Cuban Skipper (Rhinthon cubana), Puerto Rican Skipper (Choranthus borinconus) and Antillean Sedge-Skipper (Euphyes singularis). Night in San Juan. Day 8. Saturday. Trip ends this morning at the San Juan airport. Leader will be Alana Edwards, president of the NABA Atala chapter. Cost of the Puerto Rico trip is $3195/person from San Juan. Cost includes double-based accommodations, all meals, ground transportation, airport transfers, tour leader fees and entrance fees. Not included are alcoholic beverages, laundry services, and other items of a personal nature. Single supplement is $350. This trip is limited to 8 participants. 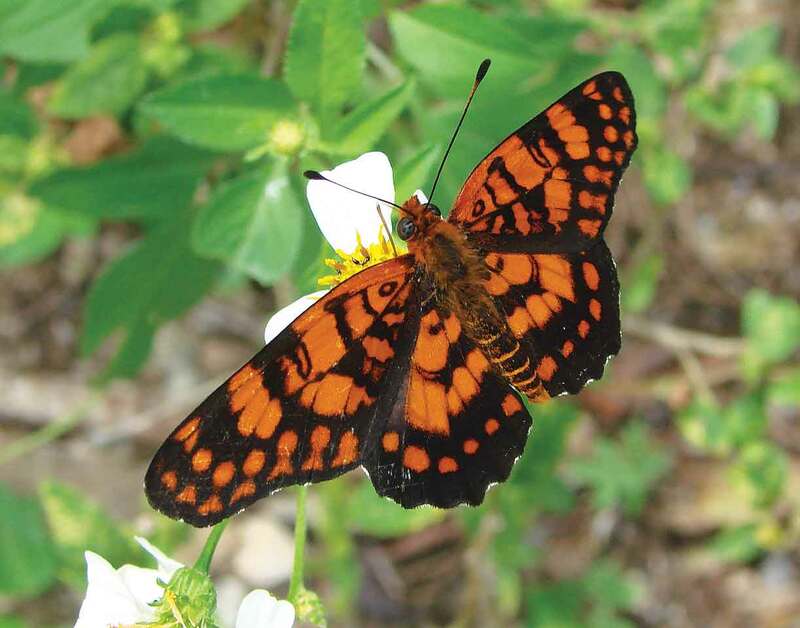 Click here for a Checklist of Puerto Rican butterflies.